Reserve your seat for the Hershey All Things Diversity March session, Know Thy Neighbor: Cultivating a Community of Respect, presented by Dr. Jeffery Long, Professor of Religion and Asian Studies at Elizabethtown College. Understanding our differences, finding a common ground, and valuing individual spirituality results in acceptance and a sense of community. Dr. Long will present major teachings and observances of diverse religious communities, as well as an overview of the religions that are practiced in central Pennsylvania. The discussion will focus on how to respond to religious differences in our local community in a way that makes everyone feel accepted and welcome. Dr. Long received his doctoral degree from the University of Chicago and became a Professor of Religion and Asian Studies at Elizabethtown College in 2000. He is the author of A Vision for Hinduism, Jainism: An Introduction, and The Historical Dictionary of Hinduism. His department at Elizabethtown College has recently pioneered the nation's first major in Interfaith Leadership Studies. He will be speaking both from his expertise as a scholar of religion, his experiences in the local Hindu community, and extensive travel to India, Japan, and Europe. The session will be held on Monday, March 19, 5:30 p.m. at Hershey Story Museum, 63 W. Chocolate Avenue. A light supper and dessert will be provided to attendees. The Downtown Hershey Association has announced Hershey’s first annual Culturefest to be held on Saturday, June 23 from 12:00 to 8:00 p.m. in ChocolateTown Park. It's a celebration of art, food, and music from nationalities around the world! This cultural event will bring the community together to experience global arts, music, dance, ethnic dishes, fine crafts, local flavors, craft beer and wine, and downtown businesses. Children’s activities will feature interactive programming highlighting a variety of cultures. Art vendors can learn more and apply here. 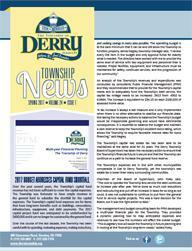 Visit the Downtown Hershey Association's website for more information. Daylight Savings Time begins on Sunday, March 11. Don't forget to move your clocks ahead one hour before you go to bed on Saturday night. Monday and Wednesday- 4:00 to 8:00 p.m.
Friday and Saturday - 8:00 a.m. to 3:00 p.m. Expert George Weigel Presents a Plan to Keep Your Garden Looking Great! 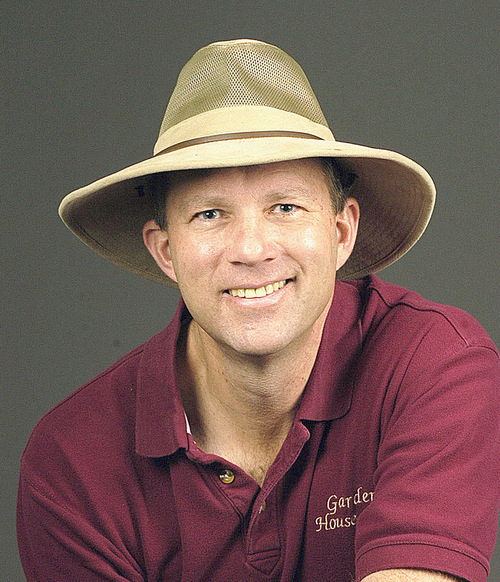 George Weigel, gardening columnist for the Patriot-News/PennLive, will present "Smart Gardening: When to Do What to Keep Your Yard Looking Great," on Sunday, March 4, at 2:00 p.m. at the Hershey Public Library, 701 Cocoa Avenue. The event, sponsored by the Friends of the Library, will provide a month-to-month plan to keep your garden in tip top shape. His book Pennsylvania Month-by-Month Gardening explains the tasks that need to be done. Books will be sold at the event. "Deborah Sampson by Anne Pasquale" is a Children's Series Program sponsored by Friends of the Hershey Public Library to be presented on Sunday, March 11, at 2:00 p.m. at the Hershey Public Library, 701 Cocoa Avenue. Anne and her accompanist bring the story of the "secret soldier," the American Revolution's only acknowledged female combat veteran to life, through interactive re-enactments and storytelling, highlighted by stage combat and live music of the period. A wonderful show for anyone interested in colonial history or the American Revolution. No registration is required. It's Time to Play Chess! 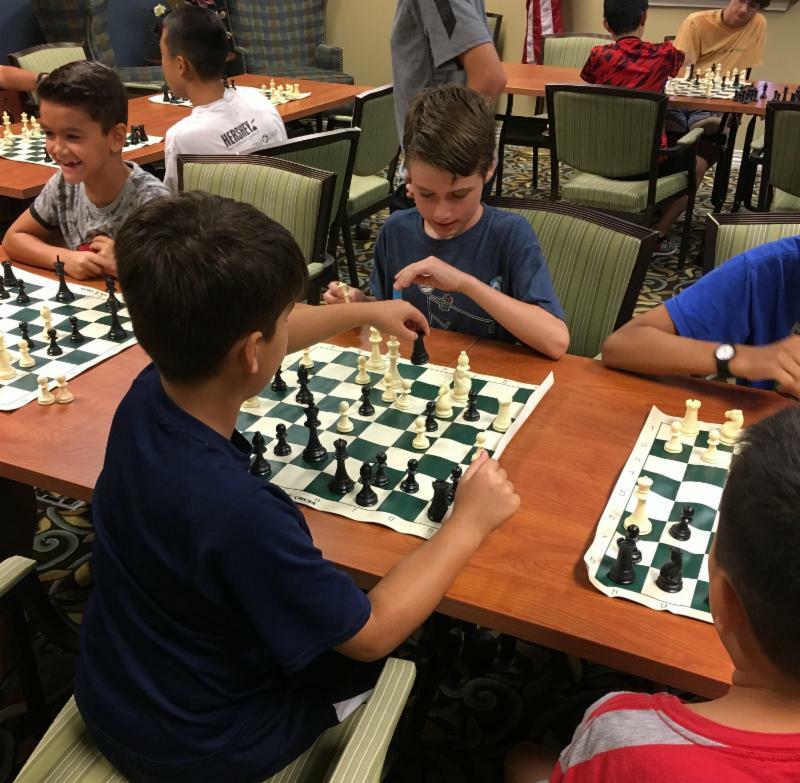 Chess Club will meet on Saturday, March 3 and 9 at 1:30 p.m. at the Hershey Public Library, 701 Cocoa Avenue. All levels of experience are welcome and no registration is required. Please note that children ages 12+ may be in the library alone, but younger children will need an adult in the building. In The Middle: Games will be held on Wednesday, March 7 at 3:00 p.m. 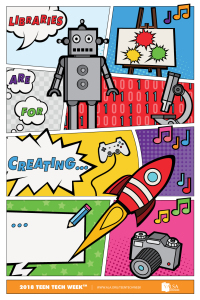 Teen Tech Week will feature techno “games” - ozobots, Flashing Robot Cards, and littleBits circuits. This program is suitable for students in grade 6 and up. In The Middle: Art will be held on Wednesday, March 14 at 3:00 p.m. The project will feature floating and flying 3-D art! Some say March is the windy month and so we will create moving art that will float and fly around your room. Open Space is a time for kids in grade 6 and up to chill out at the library. While there is no structure to Open Space, it is supervised by members of the library staff. Teens come to spend time reading, listen to music, play games, do homework, and chat. The spring Shred-It Event will be held on Saturday, April 21 from 8:00 to 10:45 a.m. at the Public Works facility, 650 Clearwater Road. Start to gather documents that contain your personal information that you no longer need and bring them to be destroyed to protect your information. 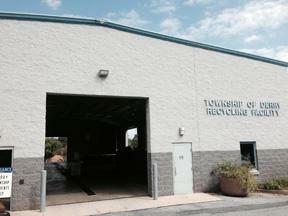 This event is for Derry Township residents only and is limited to two bags/boxes per resident. 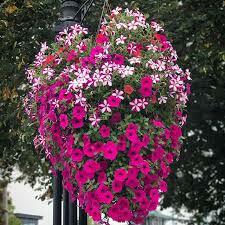 Beautiful Flower Baskets For Sale! The William S. Bowman Trust is selling flower baskets just in time for Mother's Day! Proceeds from the sale of 11" baskets for $20 and 12" baskets for $25 will benefit the William S. Bowman Trust for the horticultural beautification of Hershey. 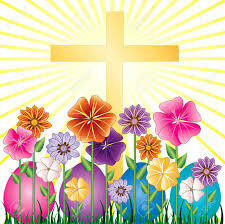 Pre-order and pre-pay for your basket(s) by March 23. Baskets will be available for pick up on Saturday, May 12 at the Hershey Theatre parking lot, located behind 14 East Chocolate Avenue, between 9:00 and 11:00 a.m. The Downtown Hershey Association will meet on Monday, March 5, at 5:30 p.m. in the lower level of The Hershey Story, 63 W. Chocolate Avenue. Stop by to learn more about the exciting plans for the year's Life on Chocolate events. 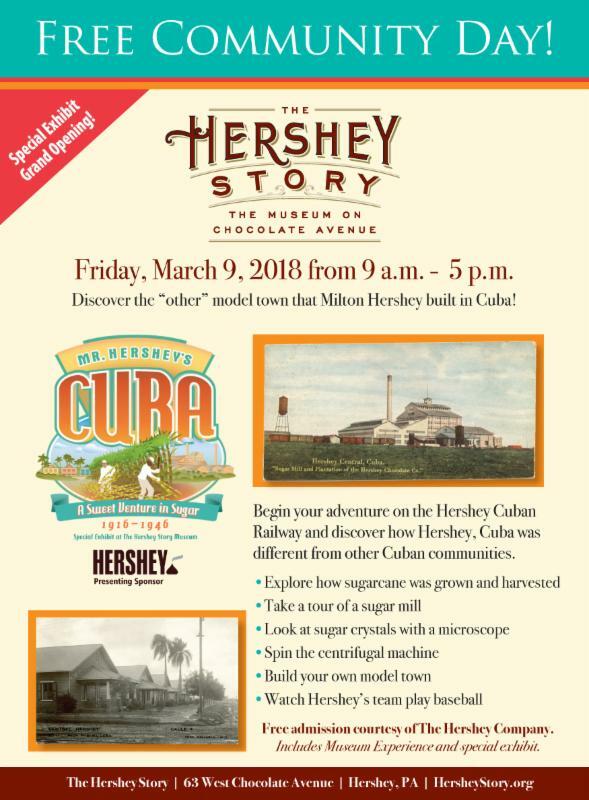 Experience the opening of The Hershey Story's newest special exhibit, "Mr. Hershey's Cuba: A Sweet Venture in Sugar". The interactive, family-friendly exhibit tells the story of Mr. Hershey's other model town and explores how sugarcane is grown, harvested, milled and turned into raw and refined sugar. Guests can also explore the Museum Experience at no charge on March 9. A special thanks is expressed to The Hershey Company for sponsoring this exciting community event! Hershey Boy Scout Troop 65 will hold its annual All-You-Can-Eat Spaghetti Dinner on Saturday, March 10 from 4:30 to 7:00 p.m. at the Holy Trinity Lutheran Church of Hershey at the corner of Cocoa and Granada Avenues. The menu includes Grandpa's famous secret homemade sauce and meatballs with spaghetti, as well as salad or applesauce, rolls and a beverage. Meatless sauce or gluten-free noodles are available upon request. Takeout is available. Those who choose to eat in will enjoy the pleasure of being waited on by a handsome young scout in uniform. Adult meals are $8 and meals for children ages 5-12 are $6; children under 5 can eat for free. Delectable desserts will be available for an additional donation. Tickets can be purchased at the door or from a Troop 65 scout. 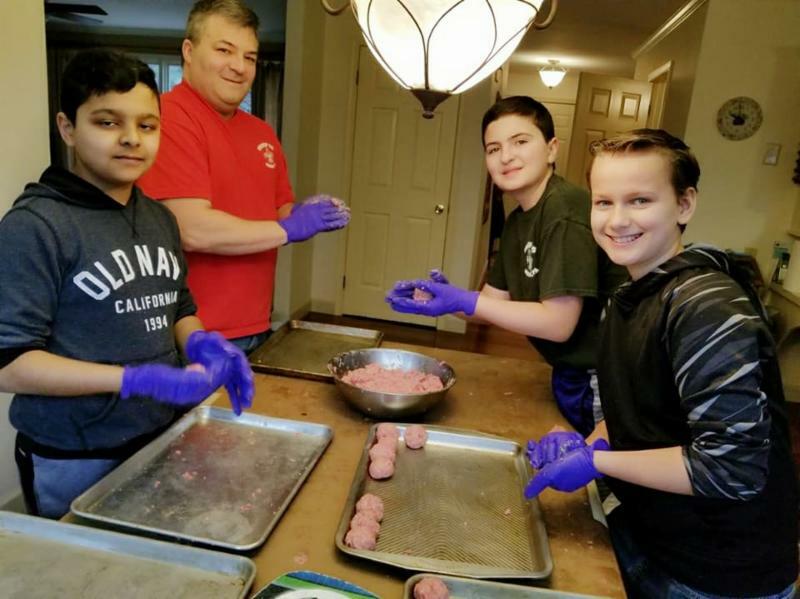 This is Troop 65's primary fundraiser for the year and one of the troop's welcoming activities for new scouts that join in early March, as they cross over to Boy Scouts from Cub Scouts. Proceeds will support the troop's programs, which include a range of camping, outdoor, and community service projects. The music of the Fabulous Four will be performed at the Hershey Theatre! The Hershey Symphony Orchestra, fronted by their own rock band, will take you on a trip down memory lane with hand-picked vocalists from across the region. 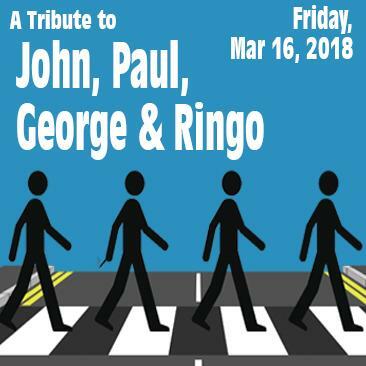 “A Tribute to John, Paul, George & Ringo” will be a celebration of the Beatles tunes that we grew up with and love. Tickets are on sale at the Hershey Theatre Box Office (717) 534-3405. The Spring Creek Church of the Brethren invites children 4 years old to 5th grade to a free two-hour event on Saturday, March 24 from 1:00 to 3:00 p.m. The event is open to the first 50 children to register for an afternoon of crafts, lessons, snacks and a Candy Scramble. Register by calling the church office at 717-533-7192. The church is located at 335 East Areba Avenue, Hershey. 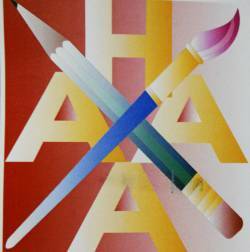 The Hershey Area Art Association (HAAA) has announced their 2018 class schedule. Sign-up to learn to draw, paint with watercolors and oil paint, or participate in a Paint Together session. Visit the HAAA's website for a class listing and information on registration.